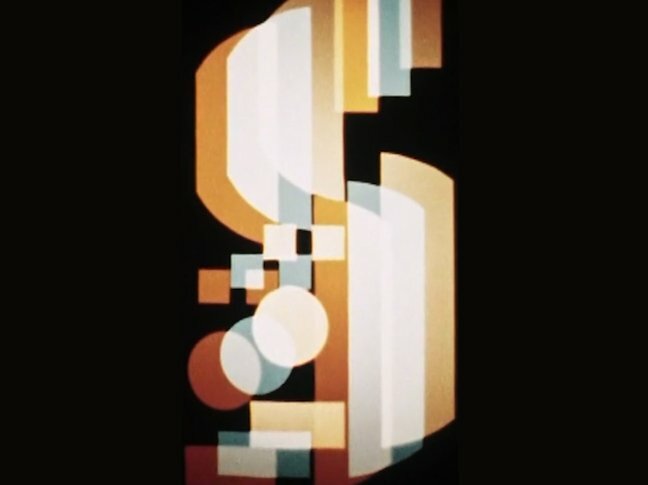 In 1922 at the home of Vassily Kandinsky, a then 25-year-old artist and student Kurt Schwerdtfeger debuted his “Reflektorishe Farblichtspiele (Reflecting Color-Light-Play)”, which in recent years has received wider recognition as a groundbreaking work of the Bauhaus movement and of 20th century film and sculpture. The piece consisting of several movements utilizes a large hand-built cube projection apparatus in which performers activate cardboard shapes and a switchboard of colored lights to form a complex, abstract light play appearing on its screen surface. “Reflektorishe Farblichtspiele (Reflecting Color-Light-Play)” was last restaged in 1966, under the oversight of the artist, who died weeks before the performance took place. This current rendition features a newly built apparatus and a visual score and soundtrack based on documentation of the 1966 presentation as well as original notes and other information from the Schwerdtfeger estate. It features as lead performer Lary 7, on the keyboard-like light system; Bradley Eros and Joel Schlemowitz manipulating the stenciled shapes, and Rachael Guma on sound and offering additional visual support. The reconstruction is by Daniel Wapner in collaboration with the gallery. Although no recordings of the original performance exist, photographs of images generated from that performance appeared in the first Bauhausbuch of works from 1919-1922, in MoMA’s 1938/39 exhibit “Bauhaus 1919-1928” as well as in the more recent “Bauhaus 1919–1933: Workshops for Modernity”, 2009/10. Special thanks to Paula and Stefan Schwerdtfeger, and Daniel Wapner. Kurt Schwerdtfeger was born in 1897 in Deutsch Puddiger, Pommern. In 1920 he joined the Bauhaus in Weimar as a sculptor and studied under Oskar Schlemmer and Johannes Itten. He first showed “Reflektorische Farblichtspiele“ in 1922 at the apartment of Wassily Kandinsky. Two years later, he left the Bauhaus and started exhibiting works along with Herwarth Walden, the Novembergruppe and Berliner Sezession. As head of the sculpture department, from 1925 Schwerdtfeger worked at the newly founded Kunstgewerbeschule Stettin. Although he was dismissed as teacher, and his artworks in museum collections were branded as “degenerate art” and removed in 1927, he continued working as an artist. In 1946 he became professor of visual arts at the Pädagogische Hochschule Alfeld, Germany, where he reconstructed “Reflektorisches Farblichtspiel“ with his students between 1964 and 1966. Kurt Schwerdtfeger died in Himmelsthür in 1966. Lary 7, Bradley Eros, Rachael Guma, and Joel Schlemowitz are each artists working with moving image, sound and performance among other mediums. They have collaborated with each other previously in various configurations including as members of the expanded cinema collective Otipus and the earlier Arcane Project. Daniel Wapner(US/German) is a New York-based artist working primarily with kinetic sculpture. He holds both a BFA and MFA from School of Visual Arts, where he currently works as a professor in the Sculpture Department. Lead Underwriting Support Provided by the Robert D. Bielecki Foundation. Generous Support provided by J.J. Kasper, Paul Jost, and Natasha Reatig. This presentation is made possible in part with public funds from the New York State Council of the Arts’ Electronic Media & Film Presentation Funds grant program, administered by The ARTS Council of the Southern Finger Lakes. Microscope Gallery Event Series is sponsored, in part, by the Greater New York Arts Development Fund of the New York City Department of Cultural Affairs, administered by Brooklyn Arts Council (BAC). Additional Support provided by Knockdown Center and Negativland. Sponsored by Colorlab and The Bodega. Official Media Partner: The Brooklyn Rail.